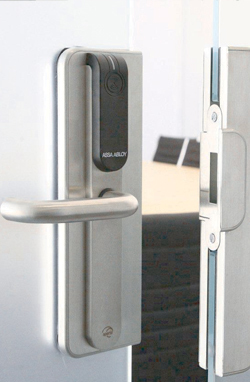 Wirelessly controlled locks minimize installation effort and cost. Any combination of compatible wired and wireless IP door control devices can be used with EdgeConnector, which provides management for an unlimited numbers of sites, doors and door-users as standard. Just one standard PoE network cable to a control hub is all that’s required for up to 16 doors to be managed, via encrypted wireless communication, within a typical range of 25m. 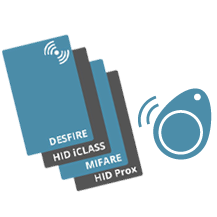 Aperio® wireless locks or escutcheons are straight forward to fit to standard doors with little or no modification, and include built-in RFID card/fob readers that are compatible with iCLASS, MIFARE Classic and DESFire contactless card standards. 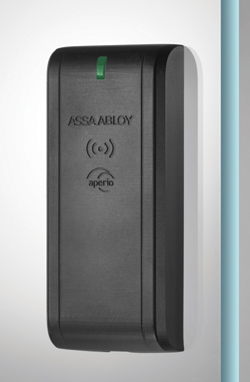 The battery life of Aperio wireless door locks or escutcheons is typically 3 years or 40,000 operations. ‘Low battery’ alerts are signalled through EdgeConnector to allow battery replacement to be managed efficiently. 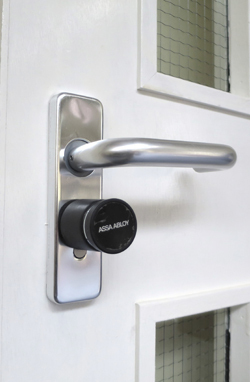 Unlike traditional magnetic locks which draw significant power continuously, whilst holding a door locked, the powered release of a lock only when access is granted dramatically reduces energy consumption. The University of Liverpool in the UK found they were saving €12000 / year on electricity costs after replacing around 1000 mag-locks with wirelessly controlled, battery powered lock escutcheons. In Europe the new prEN 13637 standard for electrically controlled exit systems on escape routes is replacing EN 179 and EN 1125. 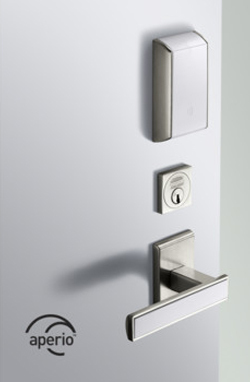 Aperio locks and escutcheons can provide the required “fail-secure” operation, with single-point mechanical door release to allow straight forward egress in an emergency. In the US, provided exit doors meet the normal requirements of emergency egress by turning a lever or pushing a panic device, the local authority having jurisdiction may regard such doors as not falling under the IBC model codes for Electromagnetically Locked Egress Doors. 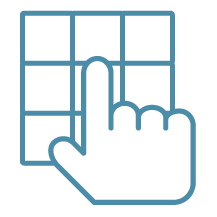 Aperio and EdgeConnector work with a range of standard RFID technologies. 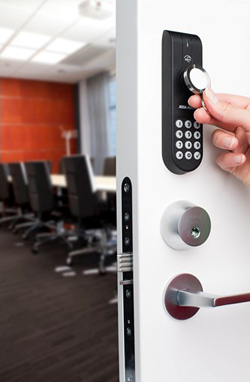 Combined door access & IT log-on ID-cards can also be configured to customer requirements. 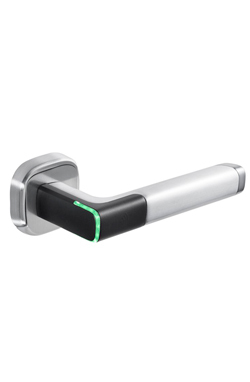 Escutcheon and lock with built-in door status sensor (Europe). 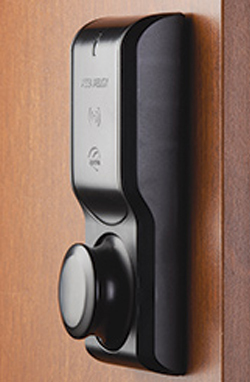 Escutcheon and lock (mortise or cylinder) with built-in door status sensor (North America). 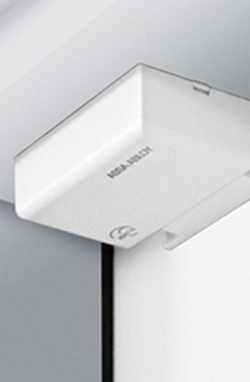 Minimalist escutcheon and handle that easily retro-fits to a wide range of internal doors. 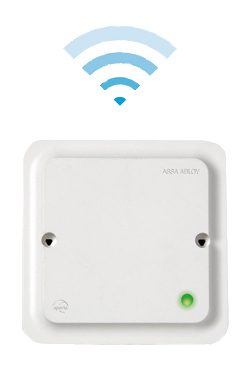 Wireless reader, together with a Wiegand hub provides an ideal solution for glass doors. Escutcheon compatible with European DIN mortice locks. Sensor to detect the state of door, window or other openings. Server rack cabinet lock, designed for standard 25 x 150mm lock openings. Locker / drawer lock with latch bolt status monitoring. Auditable asset protection. Cylinder lock compatible with European DIN mortice locks. Wireless hub for IP networks. 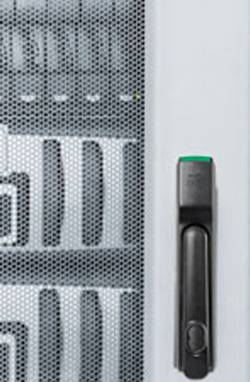 Securely connects up to 16 Aperio locks or sensors to the network. PoE powered.